I recently made a jewelry display board to hang in my studio so I can easily access the jewelry I sell in my etsy shop StrandedInTheCity. I thought the idea came from Pinterest, but I can’t seem to find the pin that gave me the idea. I began with an old 6-pane window I bought close to 15 years ago for $6 at a flea market. First I broke out all the glass (did this very carefully with the window inside a heavy duty garbage bag. Then I used spray adhesive to attach a piece of burlap to a foam board I cut slightly smaller than the window. I sprayed the back of the window with adhesive then attached the burlap covered foam board. I drilled in a few screws to make sure the foam stayed on. Luckly, I already had hooks on the back from when the window was previously displayed on the wall years ago. I use what I call “T pins” (not sure of the real name) to attach jewelry to the board. It’s been hanging in my studio for over a month and seems pretty secure so far. I have a larger window that is long and skinny that I plan to update next. Perhaps I’ll put it in my closet to hold my personal jewelry, which is currently out of control on various stands on my bathroom counter! This entry was posted in Uncategorized and tagged jewelry board, Jewelry display, memo board, organization, organizer, storage. 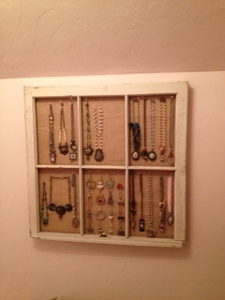 Such a great way to display jewelry! !